Stephen Rex Brown The suspect in a long string of robberies. 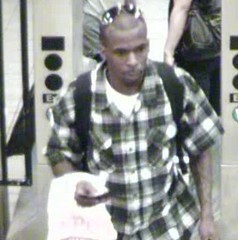 The police are on the hunt for a suspect in a string of at least 16 robberies, half of which were in the East Village. In all the cases, which take place near the East River, the perpetrator either flashed a knife or gun, or simulated one. He then attempted to take his victims’ property — common items include cellphones and wallets — and usually succeeded. None of the victims were hurt. In the first four incidents in early May the suspect robbed victims in elevators in Campos Plaza and the Lillian Wald Houses, the police said. Only in the last incident on May 15 did he actually flash a weapon — a knife — before grabbing the victims Sony PSP, cash and a watch. The same day that the previous incident occurred, Deputy Inspector John Cappelmann’s cited the crimes as a possible new pattern of robberies. In a subsequent community council meeting Inspector Cappelmann mentioned that it was possible that the suspect had been flushed out to other precincts. It appears that is what happened, at least temporarily. On May 17, 21 and 22 the suspect struck near East River Park in the Lower East Side, according to the police. In one case he flashed a knife, in another a gun, and in the third he merely simulated the gun. Since then, the suspect has struck eight more times, as far north as East 23rd Street, and as far south as Montgomery Street and East River Park, the police said. The suspect is thought to be in his 30s or 40s, and around 6 feet tall.